Our Android Beta version of MycoMap Mobile is now available for testing. We have pulled our beta app from testing until the web interface is more robust. A beta version of an application means that there are still some known bugs in the software that are being worked out. In order to download MycoMap Mobile, join the following Google Group: MycoMap Mobile Beta Test. Members of that group have access to the Google Play link that will allow the app to be installed on your Android device. It will also allow you to have access to updated versions of the application as they are released. An IOS version of this application will follow a final release of the Android version. We cannot guarantee that all reports you made will be saved during the beta testing phase. Please save your photos and notes elsewhere as well, until a final version of the app is released. You can help us to improve the app in this early phase, by reporting any bugs you encounter to our Bug Tracker. This will help us get the application to the point of a final release very quickly. Documentation on the features of MycoMap Mobile will be available before release of the final version of the app. Have ideas for how the app can be improved? 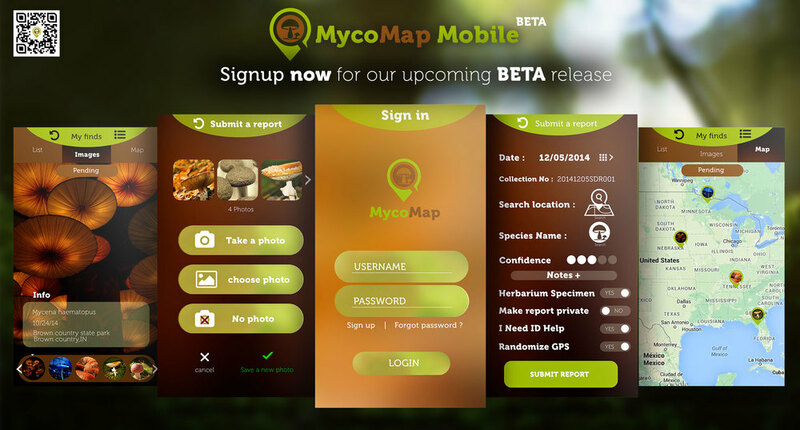 Want to know the future planned functionality of MycoMap Mobile? Please visit our Suggest Functionality forum to learn more about future releases and to leave your comments about how the mobile app can be improved. A list of all the currently known bugs can be found at the link. They will be fixed with the next beta version. The primary performance issue right now is the speed of the search when Mushroom Observer observations are included in View Reports. We are working hard to improve the performance of this feature. As you may be aware while visiting this site, the mobile application is only a small portion of the MycoMap project. Very soon, you will be able to view your reports online, vote on common names for all species of mushrooms, upload and listen to audio of how professional mycologists pronounce scientific names, download and upload open access scientific papers, and much, much more. Most of this functionality is currently disabled, except for a few snippets. If you would like to help out with this project overall, or if you have any other questions, please send an email to steve@mushroomfarm.com. We would be happy to talk with anyone about this project.